She is considered as the epitome of the womanhood, yet she is the cause of the great Kurukshetra war. She is said to be the binding force behind five Pandava brothers, yet she is the major fault line between their ideologies. She is regarded as the mind (mann) which controlled five senses (indriyas), yet she is the body controlled by the five senses. She is loving, caring and tender at one point of time, someone with full of life rasas and she is also a rebel, vengeful, and fiercesome at other times. She is known by many names and every name of her define one of her different qualities. She is Draupadi. She is Krishna. Krishna is the birth name of Draupadi. The one with dark and pure skin, radiating the purity, honor, and principality. This makes her the third Krishna after Vasudev Krishna, and Pandu's Krishna Arjuna. Draupadi is also known by the name of Yagnaseni (or sometimes spelled as Yajnaseni) as she was born from agni vedi of the yagna. Her father Drupada performed the Putrakameshti Yagna, in order to get a son, who can take revenge from Drona (who with the help of Yudhisthira and Arjuna took the half of his kingdom, Northern Panchal). It is said, a few moments after, the birth of Drishtadyumna, Draupadi was born. Some says that they both were born at the exact same moment. Later, Drishtadyumna fulfilled his father wish in the great Kurukshetra war. Draupadi simply means the daughter of Drupada. It is said, Drupada initially discarded the Draupadi, simply because she is a girl child and he only wants a boy. But later he grew affectionate for her, maybe because of a sage prediction (in which, the sage predicted that he will be known among future generations because of her, not his son) or maybe because of Yudhisthira and Arjuna who snatched the Northern Panchala for Drona, along with three other Pandava are now his son-in-laws, and may turn helpful in taking the revenge from Drona. Eventually, in Kurukshetra War, Pandavas fought against their guru Drona, and with help of them, Drishtadyumna killed Drona. The one who is from the land of Panchal. As she was the Princess of Panchal, she came to be known by the name, Panchali, to the people, outside of Panchal. It is general practice, and still prevalent in rural India, to give a byname to the bride who is from a different city or town. One from the lineage or Prishata (or simply, the granddaughter of Prishata). Prishata is the illustrious king of the United Panchal (a Mahajanapada as powerful as Kuru) and father of Drupada. She is known as the Nityayuvani, as she received the boon to become virgin on every fortnight by Shiva. A more appropriate translation for Nityayuvani, a girl who can act and love like a new person on every new day. 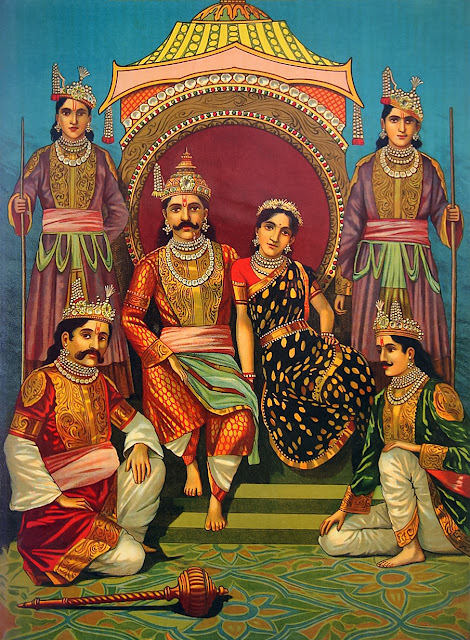 During the thirteenth and final year of their exile, the Pandavas along with Draupadi assumed secret identities. She became Malini the Sairandhri, a maid who specializes in at least one form of the art and Draupadi was an expert florist and stylist. Drupadakanya is simply a variation of the name Draupadi, which again means the daughter of Drupada. Panchami, the sobriquet should not be confused with the Panchali. The name Panchami is associated with five Pandva, and it means "one with five husbands."